(Newser) – Dan Richman must have missed the "do not disturb" sign. Officials believe the 54-year-old hiker interrupted a pair of bears that were trying to mate when he was attacked Monday in the Sierra Madre foothills of California, the Los Angeles Times reports. According to KABC, Richman was going along a trail when he saw a bear on its hind legs 50 to 100 feet away. It was his first time seeing a bear in person. "I was pretty freaked out," he tells KTLA. Richman turned around to leave and saw a second bear much closer. His attempt to scare it off by yelling failed, and it attacked when he tried to run by it. Richman played dead, letting the bear put its jaws around his neck, until it gave up. 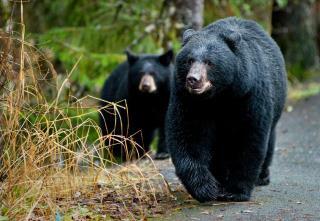 "... a local police chief describes it as a "pretty good bear attack." "I give it two thumbs up", he says!